From pitch to popcorn, our students learn every stage of the visual storytelling process to bring their filmmaking dreams to life on screens of every size. A degree in Digital Cinema from SOU offers visual storytellers the creative skills, technical immersion, and faculty mentoring they need to turn their ideas into compelling moving images in preparation for a wide array of media-making careers. Experiential classes give students ample on-set opportunities to put their understanding into action in a supportive environment where failure is celebrated as an integral stage of the learning process. We encourage our student filmmakers to chart new territory and create courageously, challenging themselves to push the boundaries of the possible. Our small class sizes promote camaraderie and community among students, planting the seeds of an essential professional network and sharpening skills in collaboration and communication. Students engage in frequent peer feedback and peer mentoring, learning as much from one another as from their faculty, and develop the advanced group problem-solving skills necessary to a career in professional production. Essential Skills: Every course in the Digital Cinema curriculum teaches essential skills that are highly transferable to any career or discipline. These include skills in leadership, communication, adaptability, critical thinking, cultural agility, teamwork, persistence, and conflict resolution, among others. Technical Production Skills: From day one in the Digital Cinema program, students work with and develop technical fluency in industry standard production tools, including camera and audio equipment and post-production software. While tool mastery is important, we also know that rapid technology shifts are the norm in the media industries, so our students learn to teach themselves new tools as they progress through their careers. Audio/Visual Storytelling: Our students learn to turn their story ideas into compelling sounds and images, moving beyond technical competency into style, narrative logic, and aesthetic coherence. Story and craft are at the core of our technical instruction. 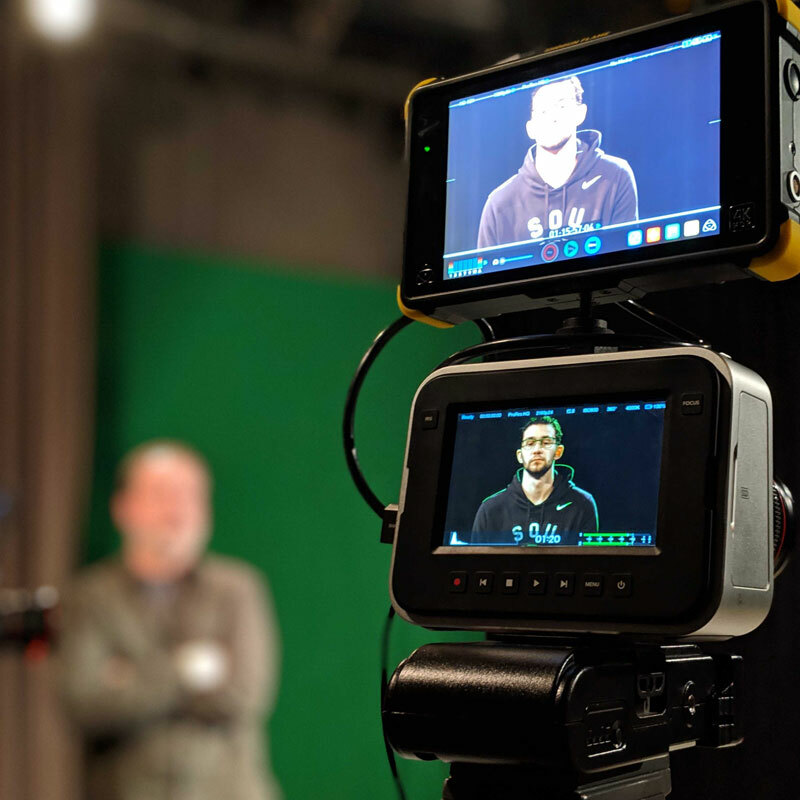 Equity, Diversity & Inclusion: SOU’s Digital Cinema program is a campus leader in creating a welcoming and encouraging environment for all student filmmakers. Every student’s voice is valued and supported, and equity is treated as a core professional competency, essential to a successful career in entertainment. Ethical & Sustainable Practice: The Digital Cinema student code of conduct is the most rigorous at SOU. Our student filmmakers know that character matters and learn to make ethical decisions in difficult situations. Likewise, our program encourages green production practices that respect and preserve our natural world. Crew Culture and Professional Preparation: Students enjoy frequent opportunities in their coursework to practice professional on-set behaviors in preparation for careers in film and video production. Our student filmmakers learn multiple crew positions, develop a diverse technical skillset, and are provided space to specialize in the areas of production that interest them most and best match their individual strengths. Regional production businesses and local media professionals offer students internships, mentorships, and apprenticeship opportunities where they can further develop their skills, resumé, and portfolio. Innovation & Entrepreneurship: Our students master conventions and standards, but they also learn to develop and produce original ideas through iteration and experimentation with novel production strategies. Students learn how to engage and grow their own audience, effectively promote their work, and incorporate feedback to revise and improve the value of their work over time. History, Theory, Research, Critique, and Inquiry: The Digital Cinema program holds true to SOU’s liberal arts foundation and works with students to frame their creative practice within the context of their broader education. Cinema production is an interdisciplinary science, artform, and business, and our students learn to make connections between these branches of understanding. Every student explores the history and theory of film and media production, learns to support their curiosity and creativity with rigorous research, and learns to apply critical thinking to the analysis of media texts. The Digital Cinema program is designed to meet every learner at their incoming level of experience. Students with no media production experience will jump-in with our Production Tools series of courses to get them up-to-speed with camera, audio recording, and editing software skills, while students entering with more experience in these areas can immediately move into more advanced production coursework. Any student with curiosity and tenacity has what it takes to succeed in Digital Cinema. Every Digital Cinema student takes courses in storytelling, film history and analysis, foundational production skills, audio recording, lighting, cinematography, editing, entrepreneurial producing, innovation, media theory, and deep professional immersion. Elective pathways include screenwriting, directing for the screen, documentary production, and virtual reality. Every Digital Cinema student contributes to a year-long Capstone project in a substantial role, such as director, screenwriter, producer, cinematographer, or editor. Capstone projects include short films, documentaries, web series, commercials, virtual reality experiences, and other forms of media. Each Capstone student also completes a portfolio or reel to be used as a professional work sample.